Outlook: With a weakened conference budding teams are looking to make moves in the ACC. Florida State lost Christian Ponder but still has talent all over the place. They're hoping E.J. Manuel can be a later version of Ponder. Defense and running has always been Virginia Tech's strength. David Wilson is the next in a long line of talented backs. The defense is also strong with Jayron Hosley and Bruce Taylor. Russell Wilson is gone but NC State isn't dead. The Wolfpack are hoping for big years from QB Mike Glennon and TE George Bryan. The offense is less mobile but still talented. With Jacory Harris, LaRon Byrd and a good offense Miami is really hopeful. The passing game is their strength but new coach Al Golden has always been a run-first guy formerly at Temple. The Maryland Terrapins are strong even without wide out Torrey Smith. Danny O'Brien is hopeful at the QB position. Their is a lot of controversy at UNC right now. The defense is loads weaker but still has hopeful sophomore quarterback Bryn Renner. He has a huge arm and has options with Erik Highsmith and Dwight Jones. Most of the offense is weaker but Paul Johnson will still find creative ways to help Georgia Tech win games. 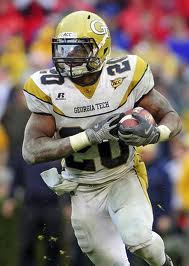 Roddy Jones is the next, speedier Jonathan Dwyer and the offensive line is still very solid even without center Sean Bedford. 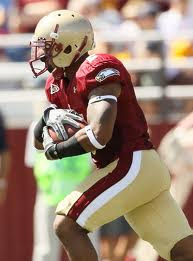 Boston College has a speedy, talented back in Montel Harris and linebacker Luke Kuechly. 14 starters is good enough for a bowl appearance. I still like Clemson a lot. Even without quarterback Kyle Parker, Da'Quan Bowers and DeAndre McDaniel the Tigers have talent. Tight end Dwayne Allen and runningback Andre Ellington. Virginia lost Ras-I Dowling but still has some, slim talent. Duke has had talent over the years but in a top conference they won't contend. Without Riley Skinner Wake Forest struggled and won't get over him for a long time.